Barcodes are machine-readable representations of alphanumeric data. Whereas a human being would read and possibly mistype a string of numbers and letters, a barcode scanner zaps the barcode graphic and the related data can be quickly retrieved or entered. This saves time and reduces human error. But do you really need to use barcodes? Does your company have few assets to track? Is your asset management system simple, like a spreadsheet? Are your assets primarily stationary and used by very few people? Do you prefer not to invest in the extra software and barcode scanners? In simple situations barcodes add unnecessary complexity. But beyond a certain threshhold the usage of barcodes in managing assets is imperative. If your assets move around a lot and the standard operating mode of your business is a state of flux, a barcode-enabled management system can help maintain proper order. Printing barcodes on asset tags is free. 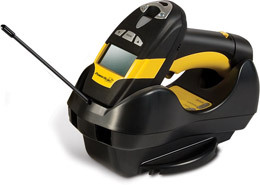 Barcode scanners are relatively cheap and may work with your existing software. Tracking assets with numbers is so passé. Barcodes are the way of the future! You'll look totally cool strutting around with a barcode scanner, like Clint Eastwood shooting asset tags. Your colleagues and competitors will be impressed you are now barcoding your assets. You'll improve efficiency and reduce errors by automating asset tracking. Which kind of barcode is right for you? Undoubtedly you've seen these nifty black and white graphics on just about every product you’ve ever purchased. Food, clothing, electronics and pink plastic lawn flamingos are all shot straight from the manufacturer in Guangzhou through Wal-Mart and into your possession via the lightning-fast legibility of barcodes. Most retail products use UPC or EAN barcodes, but other symbologies like Code 39 and code 128 are more common in asset management and property identification. Also known as Code 3 of 9, this barcode format is widespread due to its simplicity and versatility. Alliance has been developing barcoded property identification labels since 1984 and the vast majority of our customers use this format. It is conveniently available as a downloadable font. The same barcode used on your asset tags could be printed on a document which references the asset, like a project tracking sheet or invoice. All these uses help unify your asset management system. A bit more sophisticated, this barcode format uses a check character to verify data accuracy. Special calculations need to be made, usually by a software application. However, the resulting barcode compresses more data into a tighter spot compared to Code 39. Alliance Tag offers a variety of innovative solutions to satisfy the unique needs of our customers. Often we create custom asset tags and property identification labels for industrial, military and commercial applications. The Data Matrix code is increasingly popular. It’s high-tech! It’s highly scalable! It’s high-density! It just might be your destiny. This snazzy barcode is commonly found on tiny electronic components and is widely used in the shipping industry to track parcels. You want it? We’ll print it on your asset tags! Feel free to contact us for more information, or design your own asset tag in under a minute!